I discovered these chips made by (Rhythm Superfoods) a few months ago when I was looking for new foods that fit completely into the diet I follow, The Paleo Diet. I also bought a dehydrator so I could make Kale Chips at home, but it is a little time consuming and labor intensive. 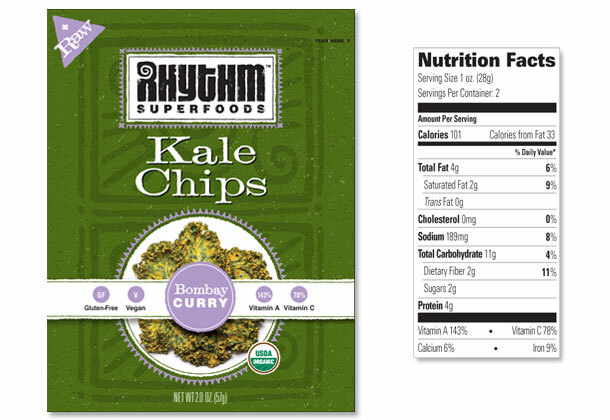 I rarely ever eat anything out of a bag or a box anymore, but these chips are an exception because they are nutrient-rich, raw, vegan, gluten-free and non-GMO. I love these chips as an occasional treat food (a treat because they retail kind of high at $6.00 per bag, and each bag only contains 2 servings). What is so healthy about these chips is that instead of baking or frying, the chips are air crisped at a low temperature which maintains raw living enzymes and maximizes nutritional potency. Kale is considered a superfood, and as a member of the cabbage family, it's rich in powerful antioxidants, phyto nutrients and carotenoids. It's also an excellent source of Vitamin A, C, K, B6, Calcium, Manganese, Iron, Potassium, and fiber. I am addicted to the Bombay Curry flavor. Here is the list of ingredients: organic kale, organic cashew, organic zucchini, organic onion, organic carrot, organic yeast powder, organic shredded coconut, organic cilantro, organic apple cider vinegar, organic ginger, organic lemon juice concentrate, organic spices, sea salt. I love that I can pronounce everything in that list and none of the ingredients were created in a lab. For more information on Rhythm Superfoods and their other products, you can follow them on twitter here, or on Facebook here.